Lelouch of the Rebellion: [Vector] C.C. Minitokyo »	Lelouch of the Rebellion Indy Art » Lelouch of the Rebellion: [Vector] C.C. That outfit came as weird to me before, but now I really like it. 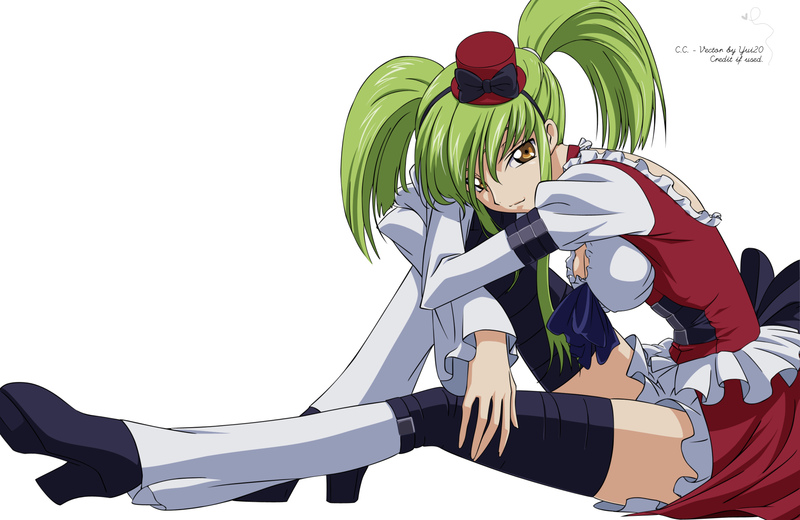 The outfits look so adorable on C.C. Well, I can see that C.C. is gaining popularity fast. I like that. The vector job is great. The outlines has the right amount of thickness, but the problem is that some are jaggy. The coloring is pretty well done. I see some lines that aren't connected, but I'm not going to say that this is actually bad 'cause I also did that on my vector and I think it gives another feeling. My only complaint is that I see an error on her ribbon (not the one on the hat). If you have time and if you want, try fixing that. A lovely vector yui-chan..like that girl pose..
You might have to improved a little bit more..but i know you can do it.. Fantastic vector there Yui20! Looks perfect, almost like a real scan. I liked this scan very much and glad to see you vectoring this. Excellent work, keep it up! You did an awesome job on the hair and it must be hard from all the little screen captures blocking the hair. It looks flawless to my eyes. I am C.C. Fan, is wonderful and beautiful this image, I like her dress. like the hair its done, the colors is good and the outline is smooth.